The AFL-CIO’s endorsement of a pipeline project expected to create thousands of infrastructure jobs has rankled liberals activists, including a member of AFL-CIO’s coalition. AFL-CIO President Richard Trumka announced his support for the Dakota Access Pipeline, a proposed 1,200-mile project capable of transporting nearly 500,000 barrels of crude oil daily from North Dakota to Illinois. Trumka said that union workers and the region will benefit from the 4,500 jobs the project is expected to create and touted the safety and efficiency of pipeline transportation of crude oil. "The AFL-CIO supports pipeline construction as part of a comprehensive energy policy that creates jobs, makes the United States more competitive and addresses the threat of climate change," he said in a Friday release. "Pipelines are less costly, more reliable and less energy intensive than other forms of transporting fuels, and pipeline construction and maintenance provides quality jobs to tens of thousands of skilled workers." Several Native American and environmental groups oppose the project, and some labor activists say that the union should rescind its endorsement. The Asian Pacific American Labor Alliance (APALA), a member group of the AFL-CIO with more than 20 chapters nationwide, joined a coalition of minority union workers to oppose the project. The Labor Coalition for Community Action, composed of the APALA, the Coalition of Black Trade Unionists, the Coalition of Labor Union Women, the Labor Council for Latin American Advancement, among others, said that the union must stand in solidarity with minority communities, rather than "corporate greed." "As organizations dedicated to elevating the struggles of our respective constituencies, we stand together to support our Native American kinfolk—one of the most marginalized and disenfranchised groups in our nation’s history—in their fight to protect their communities from further displacement and exploitation," the group said in a Monday release. The coalition called on the union to back more green energy projects and engage with more minority communities. "We remain committed to fighting the corporate interests that back this project and name this pipeline ‘a pipeline of corporate greed,’" the release said. "We challenge the labor movement to strategize on how to better engage and include Native people and other marginalized populations into the labor movement as a whole." The AFL-CIO did not return request for comment. However, Trumka addressed similar objections in announcing the union’s support for the project. He said that the union leadership was respectful of "sensitive situations like those involving places of significance to Native Americans," but was satisfied with the accommodations and environmental safeguards in the project. "Once these processes have been completed, it is fundamentally unfair to hold union members’ livelihoods and their families’ financial security hostage to endless delay," Trumka said. "Trying to make climate policy by attacking individual construction projects is neither effective nor fair to the workers involved. The AFL-CIO calls on the Obama Administration to allow construction of the Dakota Access Pipeline to continue." 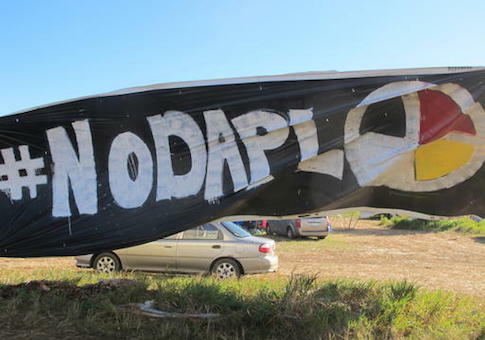 The Washington, D.C., Circuit Court of Appeals has halted construction of the pipeline, granting an emergency injunction as federal courts weigh the merits of a lawsuit filed by the Standing Rock Sioux Tribe.